Processing large data payloads used to require significant hardware investment. The Cloud opens new opportunities to perform such tasks with inherently different cost and scale characteristics. 47Lining has helped customers in energy, media & entertainment and life sciences process large data payloads at scale. Launch of a secure, scalable, redundant environment using our open source DevOps tool called Nucleator. 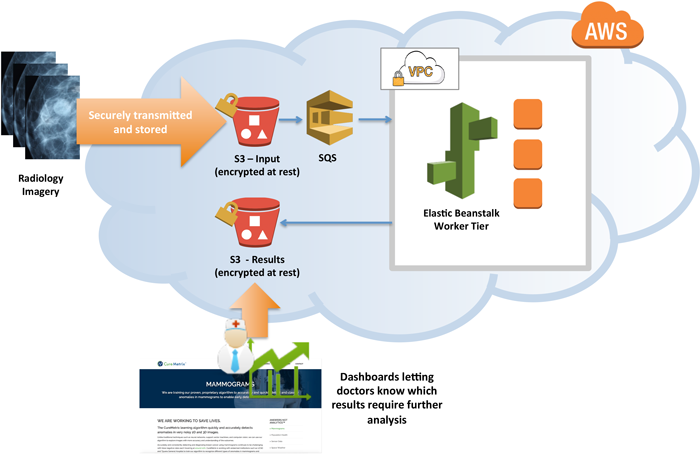 After minimal configuration, Nucleator launched VPCs with public and private subnets, Bastions, Nats, as well as an Elastic Beanstalk. Development of a controller application that can take medical imagery from a securely encrypted S3 Bucket and send a request for processing to an SQS queue. Creation of an image processing app, which runs on a worker tier in Elastic Beanstalk. The workers perform image processing algorithms on requested images and place the results in another S3 bucket. Spot instances can be leveraged to achieve attactive cost savings.